What Happened to Geerard (Gerrit) and Janna Remijnse (Remine)? My 3rd great grandmother, Johanna Remijnse de Korne had a brother named Gerrit Remine. He was born Geerard Remijnse, and like his sister and other siblings, was born in Kapelle, Netherlands. Gerrit’s birthdate was 21 February 1825. Gerrit was married to Janna Kakebeeke (Kakebeke). They had three children (that I know of). Adriana, called Johanna, who gained the surname Bosman (I’ve written about Bosmans in the past), Jennie who married Carlos Meijer (Meyer), and Richard Remine. Richard was Frank Tazelaar’s father-in-law, the father of Genevieve. I never noticed that the deaths of both Gerrit and Janna were in the same year–1910–and even if I had, they were 3 months apart, so I wouldn’t have drawn any conclusions. 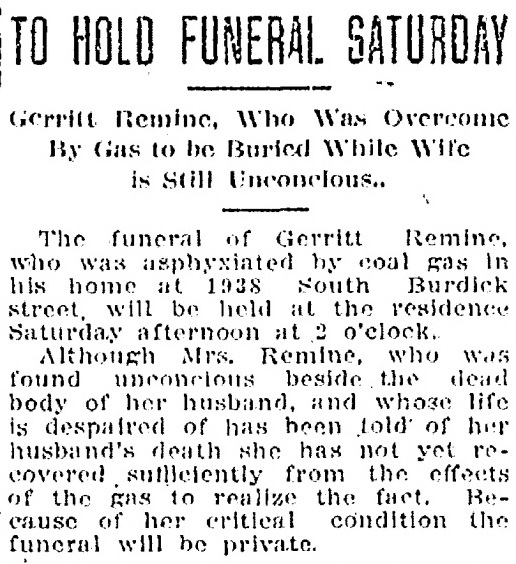 Imagine my surprise to find a newspaper article explaining what happened to Gerrit in 1910 and giving a hint about Janna. The Kalamazoo Gazette article was dated 7 January 1910. The coal gas could have come from cooking, lighting, heating, or even a broken pipe. No death certificate yet for Janna, but when I do find that it should confirm that she died belatedly from the coal gas tragedy. In this article, Janna becomes Jennie, which to my understanding makes less sense in Dutch than it does in English. And Remine is now Reminse. And look at her daughter, Jennie (Adriana) is “Mrs. C. Myers.” So Meijer that became Meyer is also Myers. Whew. And Richard Remine is now Richard Reminse. Good grief. You don’t even want to know how many ways I’ve seen Gerrit spelled! Utterly captivating, Luanne. Once again, you win Best Family Detective. Amazing story – much more personal since I have had two close calls with carbon monoxide poisoning in my home…once in my childhood and once at Casa de Canterbury. I wrote a reply to you and it completely disappeared. Anyway, I really hope you have a carbon monoxide detector at your new place. CM can be so very dangerous. A friend of mine lost her sister from CM poisoning in a hotel room. Please don’t take any more chances. Thank you so much for your kind words about my detective skills haha. I have had a lot of help in so many of the stories. This one was all mine ;). 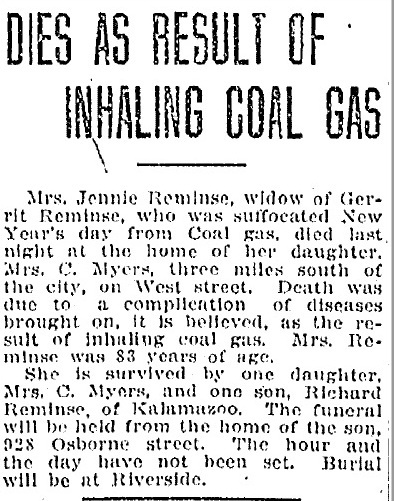 To find Janna’s story I had to search through coal gas poisonings in 1910–and there were several that year, just in Kalamazoo alone! Wow – amazing!! And yes, we have a cm detector now!! Whew! Well, that makes me feel better! I wish everyone would/could get them. I have also found some deaths in my own family due to carbon monoxide poisoning. I wonder how common it was? 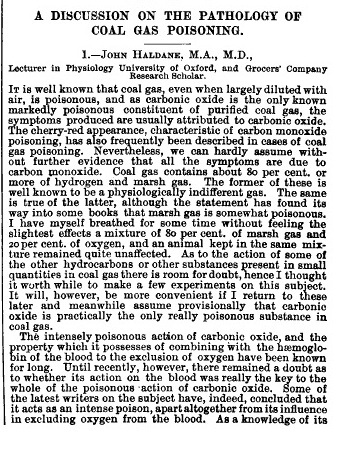 I’m not sure about CM poisoning, but as I mentioned to Sheila above, in a Genealogy Bank search for 1910 Kalamazoo “coal gas poisoning,” I found several! So I think these old accidents were quite common. As to carbon monoxide, they are still happening today. A friend’s sister passed away this way. It was so tragic as she was in her early 20s and staying in a hotel room in Europe. Since then we keep a CM detector in our house! Interesting family story. Good research. Thanks, Jose! And thanks for your good “catches” recently! Whew! So sudden and tragic. When there is more than one person felled it is more dramatic, too, and shows the silent power of the poison. You might be right about the reporters mangling the spellings! Just a medical note, for what it’s worth. When the body is deprived of oxygen via the lungs (as in suffocation or CM poisoning) the blood goes to the surface of the skin, seeking fresh air, which causes the red complexion mentioned in the article. My late husband’s name was Dannettel – Annette with a D and an L. But, boy, howdy! You can imagine the number of ways it got spelled – or pronounced! That makes horrible sense about the red complexions. Thank you for that info, Lady Anne. Dannettel is possibly one of the most unusuals name I’ve heard of yet. I can only imagine because I can barely get anybody to spell Castle right :). Jana, thank you so much. You have a beautiful genealogy site! You have a great one, also. Oh, how awful. Although it must not be a painful way to die it seems so macabre, doesn’t it? Makes me sad. Welcome back though! Thanks, Luanne! It was a great trip, but it’s good to be home. Have you written about it yet? I am writing some, but haven’t posted anything yet. Once you get bitten by the genealogy bug, you’re a goner ;)! Yes, it is such a tragic story. To think of being in such a tragic accident with your spouse of so many years (and having immigrated, too) and then to linger all that time with illnesses from inhaling the gas! Thank you for stopping by!